Throughout mankind’s early history peoples of various civilizations constantly sought to personify the world around them and the food and drink it provided. 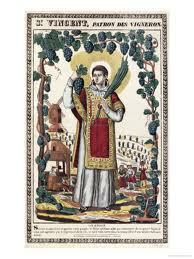 Wine, beer, grapes and grain, as fruits of the land, were usually represented by deities connected to fertility or pleasure – sometimes both, with all the scurrilous ideas surrounding Dionysus and co that are now normally associated with worship of those old gods. With the rise of Christianity, however, the role of gods as patrons was taken instead by the followers of the new religion who became spiritual heads of various trades due to their role in them during their lives and occasionally because of the way they died.